Just 15 kilometers from Siracusa is the Fontane Bianche Beach, three kilometers of ivory-white sand and crystal clear water. The beach is in part equipped with sunbeds and umbrellas and in part free. It is home to beach resorts, hotels, clubs, and discotheques: a sea for all ages where it is also possible to go scuba diving or on boat tours. It is considered one of the most beautiful stretches of beach in the region because of its resemblance to tropical, Caribbean landscapes. Calamosche Beach, in the Vendicari Nature Reserve, is one of Sicily’s most beautiful beaches and was voted the Most Beautiful Beach in Italy by Legambiente in 2005. Deep in one of the most uncontaminated areas of the region, the beach is 200 meters long and is enclosed by two promontories that taper into the clear waters. There are no kiosks or resorts, and it may be reached by foot following a path that leads to a breathtaking landscape. You may also see pink flamingos who stop here while migrating. Also in the Vendicari Reserve is the Tonnara Beach. Here there is an old tuna fishing establishment (tonnara), its remains making the landscape truly evocative. You can choose between sandy beach on one side and pebbles and rocks on the other. It may also be reached by a short walk and has no kiosks or resorts. San Lorenzo Beach in Marzamemi is one of the most beautiful beaches in the Syracuse province. The sand is fine and almost white, and is wet by clean, crystal clear water reminiscent of the Caribbean Islands. Eloro, between Noto Marina and the Vendicari Reserve, also has clean clear water. An additional attraction of this beach is the archaeological site from which it takes its name. Capo Passero is Sicily’s easternmost point. A fascinating landscape, with an islet connected to land by a thin strip of rocks that is at times underwater. On the islet is a lighthouse that makes the view even more evocative. When the sea is calm you can walk out to the islet and experience the sensation of standing between two seas. The frequent winds make this location much loved by windsurfers. Punta Secca Beach is near Ragusa and is one of the most distinctive beaches in the region because of its position – adjoining the village – and the golden sand. It is also famous because of the TV series Il commissario Montalbano. Also near Ragusa, in the fishing village of Sampieri, there is a beach of golden dunes. At one end is the Fornace Penna, a burnt-out brick factory and is known as Tonnara Mannera in the Montalbano series. In Marina di Ragusa there is a long golden beach that stretches for several kilometers between the town and the sea. It is called the “Sicilian Ibiza” because of the many kiosks and the resorts offering various types of entertainment to tourists. 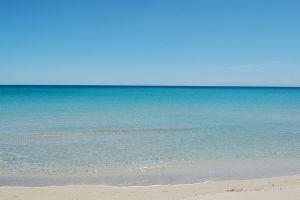 Pozzallo Beach is one of the most frequented beaches in the Ragusa area and has recently obtained the Blue Flag. Punta Braccetto, also in the Ragusa area, is a gorgeous beach surrounded by cliffs that seem to embrace the sand.